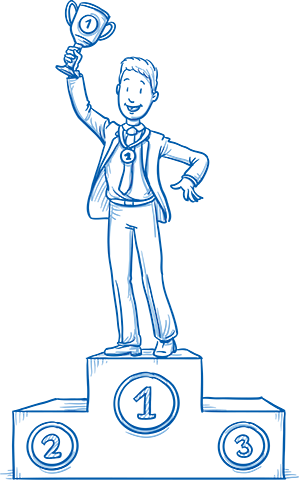 Enter the basic contest details like entry requirements and prize details. 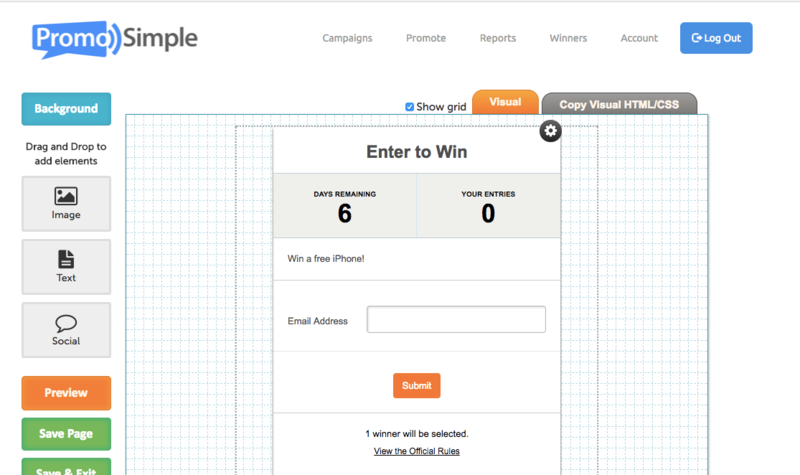 Design your entry form with custom images, colors and templates. 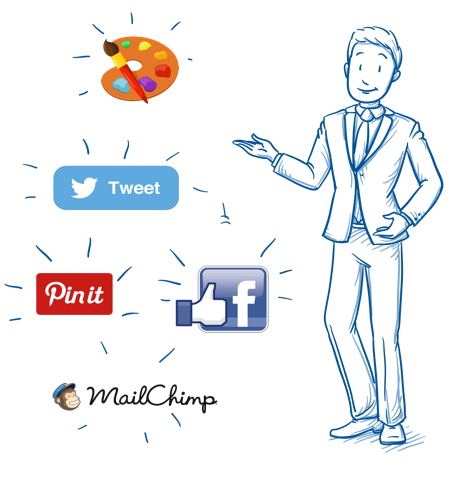 Choose social media actions to be performed or mailing lists to integrate. Simply hit a button and your contest will run on specific start & end dates. 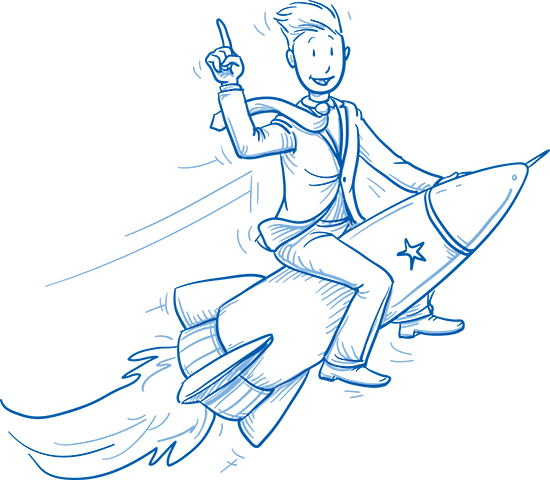 Share a direct contest link, embed into your website or sharing on our Giveaways network. Let our random algorithm pick one for you, use an external service or pick one yourself. 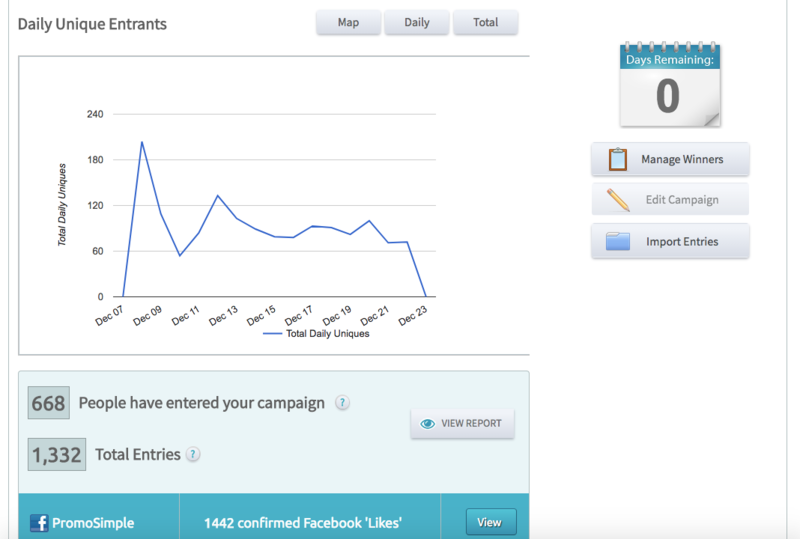 Access all of your promotion's entries with real-time reports. Export spreadsheets with your data at any time. 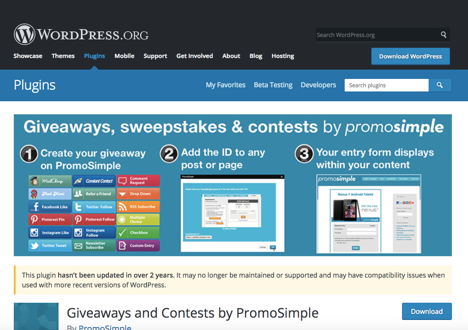 PromoSimple is one of the simplest ways to run a giveaway. 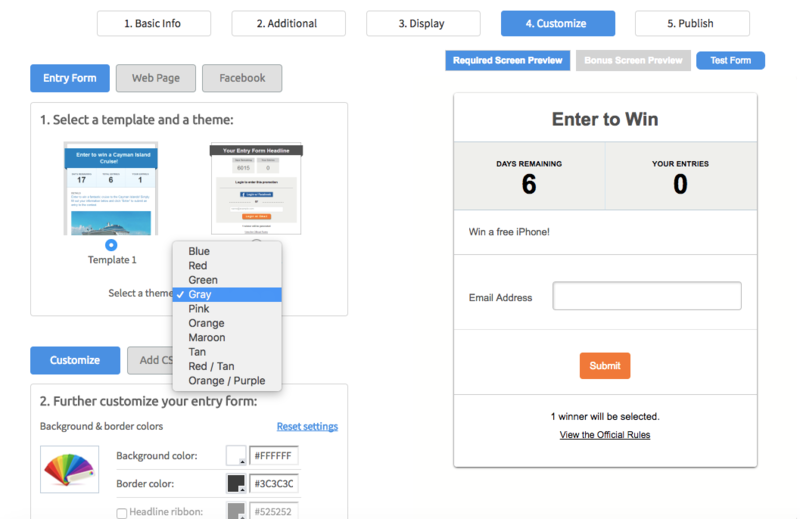 You can launch a contest by simply entering your contest details such as name, prize, start and end dates, and clicking publish. It’s as easy as that! But if you want more, we have plenty of useful features.. Capture extra fields of user data such as name, address and phone, or add custom fields. Add age and location restrictions. Add actions you'd like users to perform such as sharing your website or contest on social networks Facebook, Twitter, Pinterest and Instagram. Integrate your entry form with email service providers such as MailChimp, Active Campaign, Mad Mimi and Constant Contact. Autosubscribe any entrants to your newsletter lists, or send an immediate follow up email after entry. Rapidly increase your Facebook fan base by including 'Liking' a Page or URL as an entry option. Ask entrants to Tweet about your promotion or become your Follower on Twitter. Gain momentum for your Instagram account by rewarding 'Likes' and 'Follows'. Build brand awareness by encouraging users to Pin images or become your Follower. Upload an image to show users what your contest is about. Choose from several pre-made layout templates, or take full control and specify layout, colors and fonts yourself. If you want to get really advanced, you can customize the specific look and feel of every field with our WYSIWYG editor, or even modify Entry Form HTML and CSS code yourself. Add and edit your own images to entry forms and generate excitement for your brand and sweepstakes prize. Select from multiple templates and a variety of colorful themes to find a design that fits your website's branding. Craft uniquely designed entry forms with fonts and colors that represent your brand identity. Choose to display or hide elements in your entry form. Create your own content to show within a Facebook Page Tab using HTML/CSS and/or our WYSIWYG editor. Display a custom design or message to display to users once they've completed the promotion's required entry section. Simple WYSIWYG editor allows you to design Facebook & Microsite pages with absolutely no design experience. Just hit publish and it's off! You can share a direct URL to your promotion hosted by us in the Cloud or Embed it within your website. Our Embed promotion code has been tested to work across many many different types of websites and devices. PromoSimple has run over 50,000 campaigns. Our systems have been tested to operate at scale, so you can trust that your promotion is in good hands. Use some of our additional promotion options to amplify awareness of your campaign. Embed your contest into a Facebook page, share it on PromoSimple's public Giveaways Directory (promosimple.com/giveaways), or enable 'Refer a Friend' features to reward users for spreading the word. You can also add a PromoBar into your website to put the contest front of mind. Reward users when their friends enter through links that they've shared via Facebook, Twitter & more. Opting into the Giveaways Network gives you access to new audiences on websites, newsletters and social media. Engage your website visitors and decrease bounce rates by putting your campaign front and center with the PromoBar. Add entry forms to your websites, blogs and Facebook pages. Run a single campaign on multiple websites simultaneously. 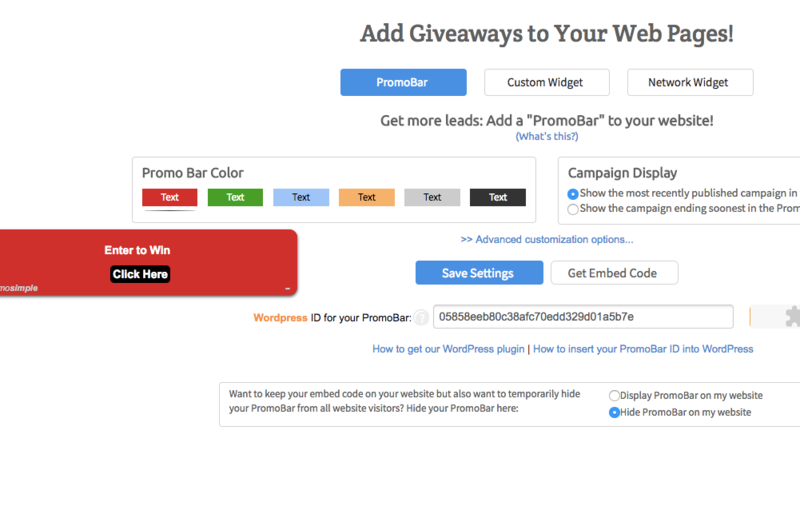 Add widgets to your websites to allow users to browse all of your currently active sweepstakes. When your promotion's ended, choosing a winner is as simple as clicking a button. 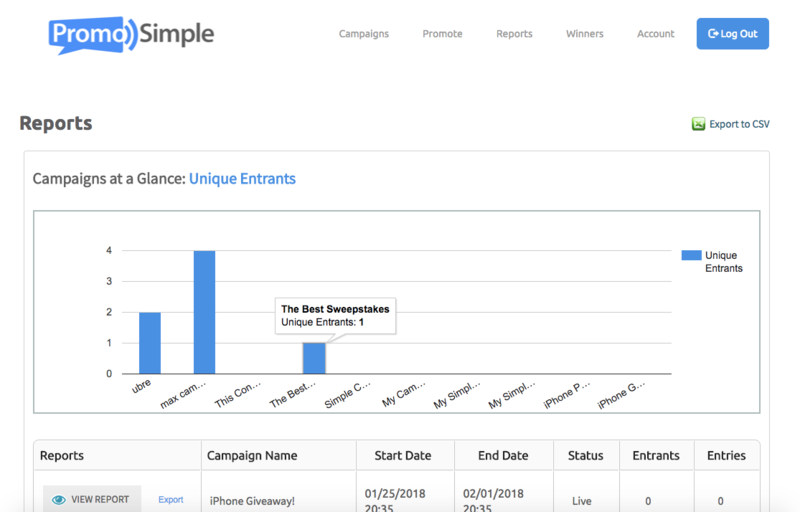 You can choose from various winner selection options such as picking one winner yourself from the final list of entrants, use PromoSimple’s random choice algorithm, or relying on the external random.org for impartiality. You get access clear and simple reporting as soon as your campaign starts. See entries coming in in real-time, or download a full summary at completion. Evaluate performance of your campaigns with entrant geographic data and daily trend reports, or drill down to see individual entrant details including IP and timestamps. All your campaign data can be exported to spreadsheets for further analysis at any time, including email address, entry time, IP address and any additional data fields or actions you've chosen such as name, address, phone etc. View your data in real-time to evaluate the performance of your campaign. Download any report or data view to CSV spreadsheets for analysis. Gain insights into your entrants with daily and geographic trend reports. We have advanced features for brands and agencies. Set your own contest rules with our rules generator. Fully white-label the entry form so no PromoSImple links or branding is visible. Integrate your own Google Analytics tracking into the entry form to keep track of your visitors like your own website. You can also design your own full microsite landing pages for your promotion. Build microsite landing pages with images, HTML, CSS and more for a completely branded user experience. 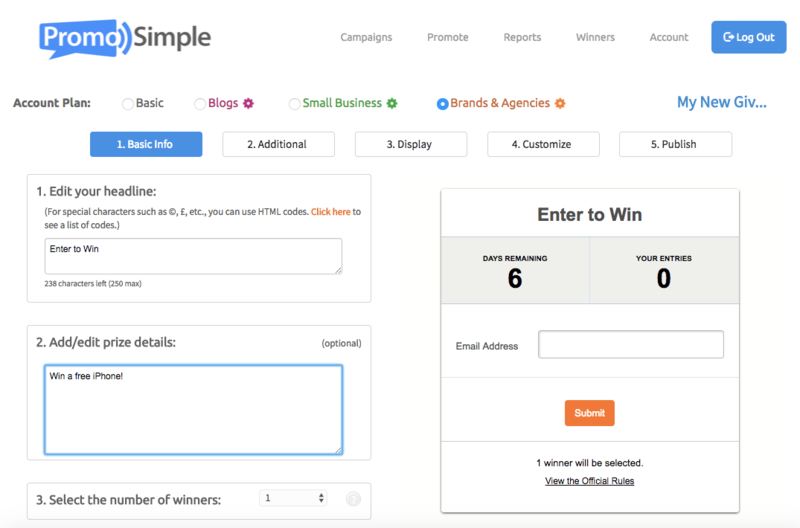 Use our White Label option to build entry forms without any mention of PromoSimple - perfect for agencies.